The last couple months have been, for lack of a better word, crazy. Busyness is consistently the story of everyone's life these days, but lately my schedule has been a taken to a whole new level of exhausting. Commuting combined with spending every waking hour studying Chinese combined with personal statement writing combined with regular life... whew. The great thing is (and I'm so, so thankful for this) that it is paying off! I applied, was admitted, and just a week ago, accepted admission to this graduate program. The summer semester takes place in Irvine, which is just perfect. I'm looking forward to leisurely sipping homemade lattes on my patio at sunrise, whipping up breakfast fruit bowls in my sunny kitchen, reading poolside, the 10 minute commute, and making happy hour at this rooftop bar. After which, we move to China! In August, we'll be moving to Shanghai, where the rest of the program will take place. 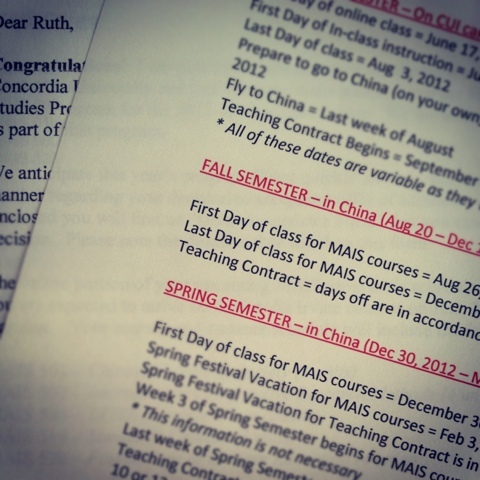 I'll be taking classes, teaching English, writing my thesis, and immersing myself in Chinese language and culture. Husband will most likely continue working in finance, ideally just transferring over to the Merrill Lynch office in Shanghai.God has brought us this far, and we trust that He has a plan for all aspects of this move. We plan on bringing our fur baby, although the quarantine period is a little scary. The details are still being worked out, but the process has officially begun! I've had a great time living and working in LA, and Irvine has been the setting for all of our newlywed memories, which I will always treasure. Leaving behind family and friends for almost a year will be so hard, especially as our flight date approaches, but I can honestly say that I'm ready for a change in scenery. LA has worn me down with its traffic, its parking, the time consumed just trying to get from one place to another. I'm ready to be present. To just stop shuffling around so much. We can't wait to explore a new city, learn a new language, try different food, while we're young and while we can. And after this, who knows where we'll be (I'm secretly crossing my fingers for Palo Alto). I'm hoping that this is just the first in a lifelong series of cities that we can call home.